Personally, I don't have any problem with the MLB font you have now, but I think if you were going to choose a different font to go with it, I'd probably pick D, so it gets the serif but is not bold, to better match the wordmark. 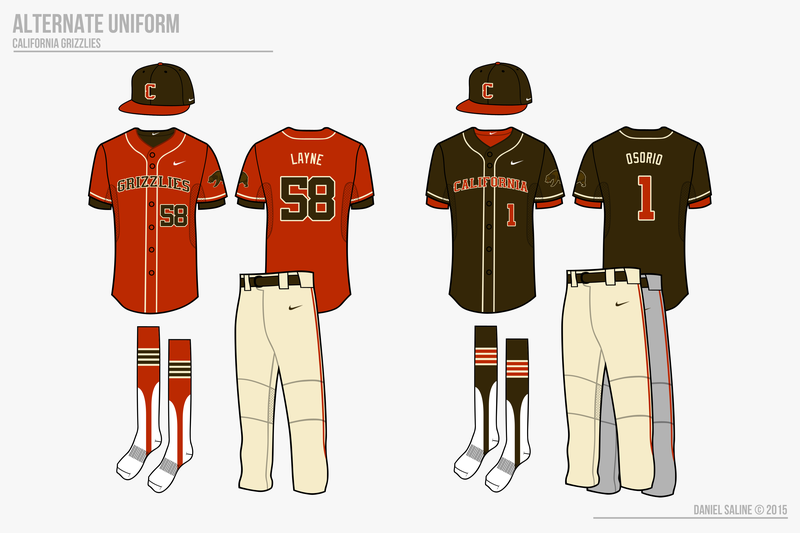 But good work on Cali, it does look better with the lightened cream, and the cap is very well done. F. Love the stuff here. If you change it definitely go with F, the modified Nationals font, as the squared off corners match the wordmark. Changing to any other of the serifed blocks would just be change for change's sake. Mind if I ask where you found that template?? I found it somewhere around here. I can't pinpoint the thread, but the original template is around in SVG format, I traced it so I can use it in Photoshop. As for the field, I traced that from Google Earth and went from there. Thanks for the comments everyone, I hope you all are enjoying this series so far! 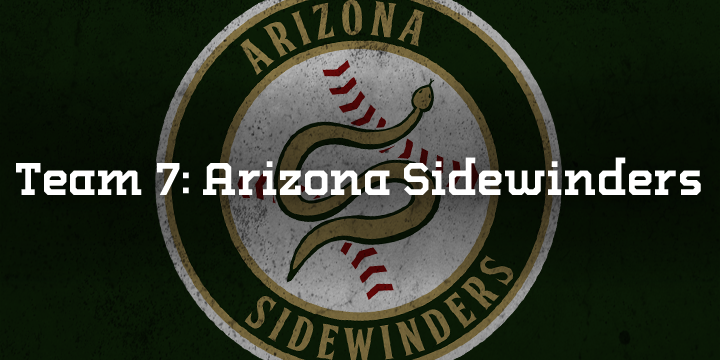 The Arizona Sidewinders have slithered back and forth between Tuscon and Phoenix, Arizona. 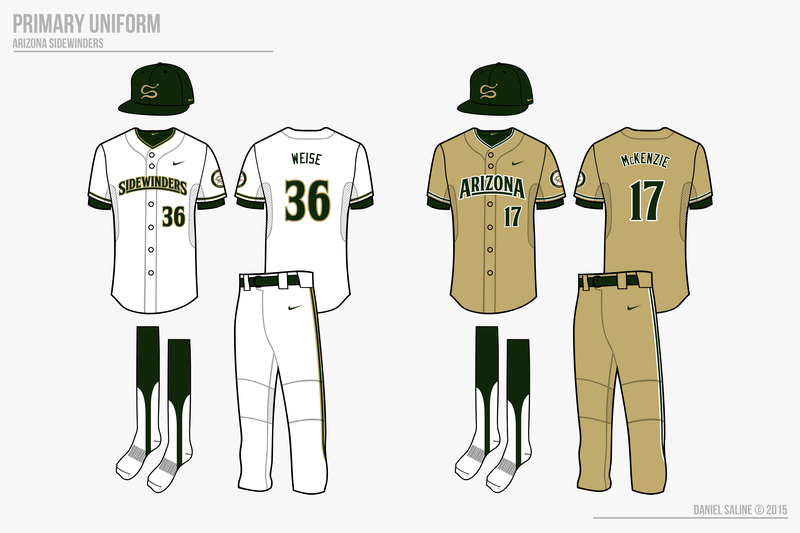 The team started in Tuscon in 1962, relocated to Phoenix in the 1980s, moved back in the mid 1990s. Despite the location changes, the name has remained the same their entire existence. 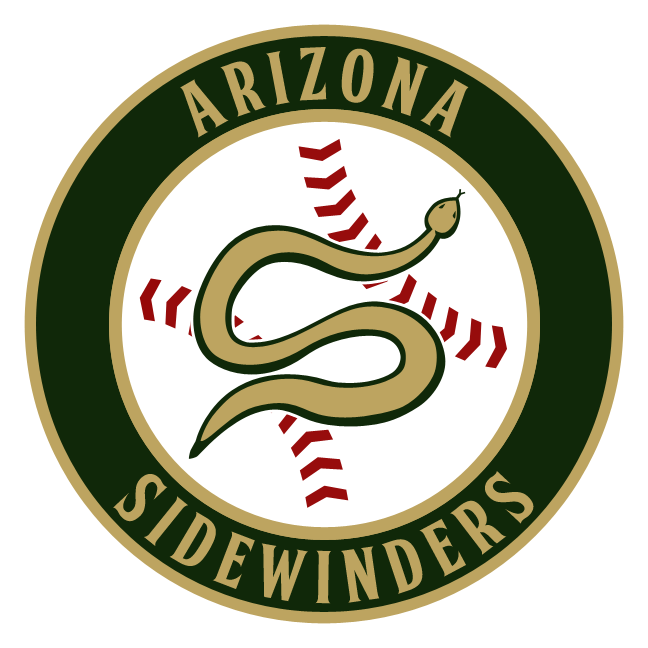 The Sidewinders’ name originates from the snake in the nearby Mojave Desert as well as the sidearm throwing slot of a pitcher. 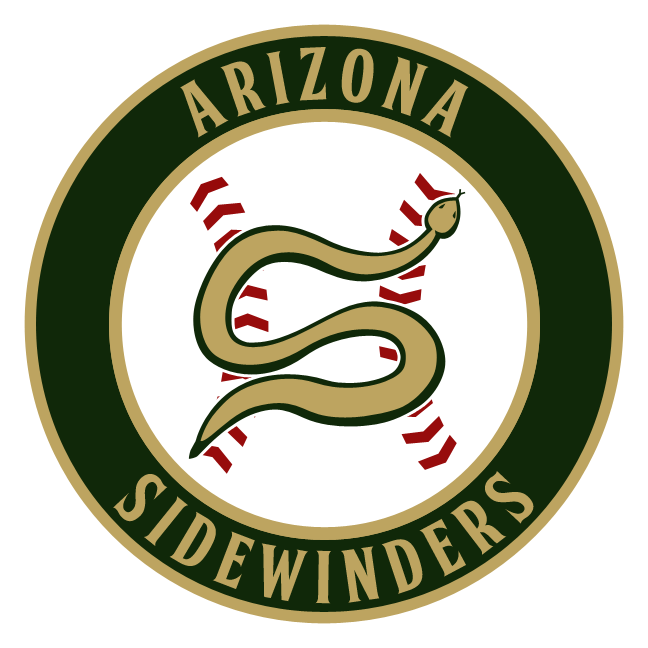 With 3 championships to their name, as well as back-to-back appearances in 2000-2001, the Sidewinders certainly have talent. The core group of Jason Weise, Jake McKenzie, and Don Griffen was the key to both the 2000 and 2013 championships, and all three returned to the Grand Canyon State. Weise and McKenzie are a lethal double play combo up the middle, and Don Griffen leads the infield behind the dish. 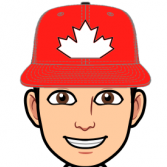 Shane Gordon, Jr. was signed before the 2014 campaign and is developing into one of the team’s top starting pitchers. Dark green and sand were chosen as the team’s colors in order to represent the area as well as create a unique scheme in the league. 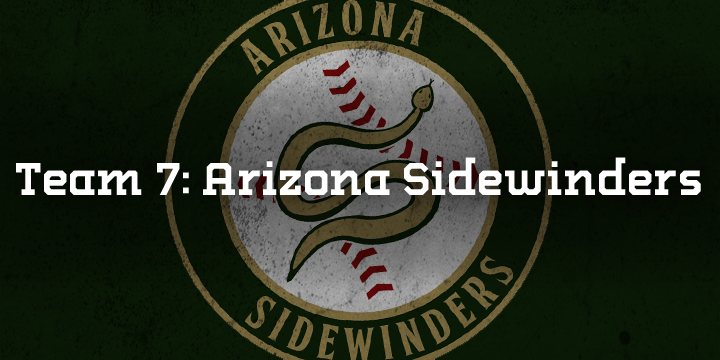 A sidewinder in the shape of an “s” is on the front of the team’s cap. 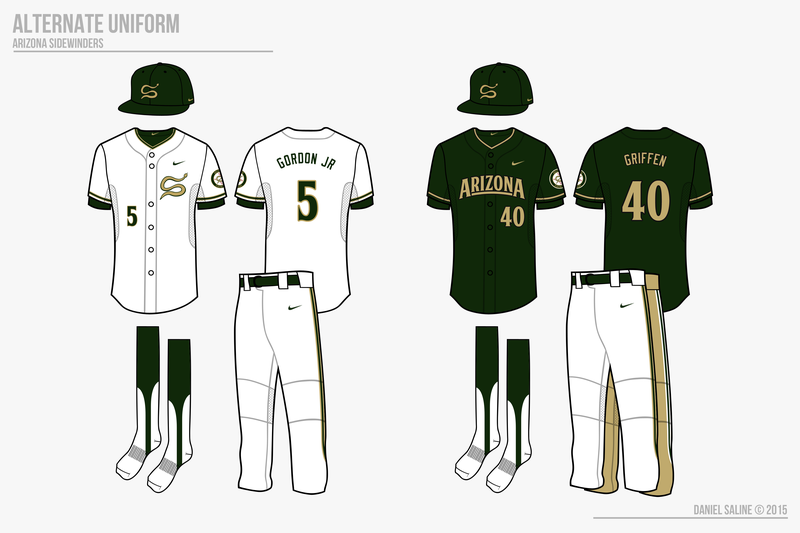 The Sidewinders also have a unique look in that they are one of few teams with a non-grey road uniform--sand tops and sand pants with green and white trim, which has grown popular with fans. 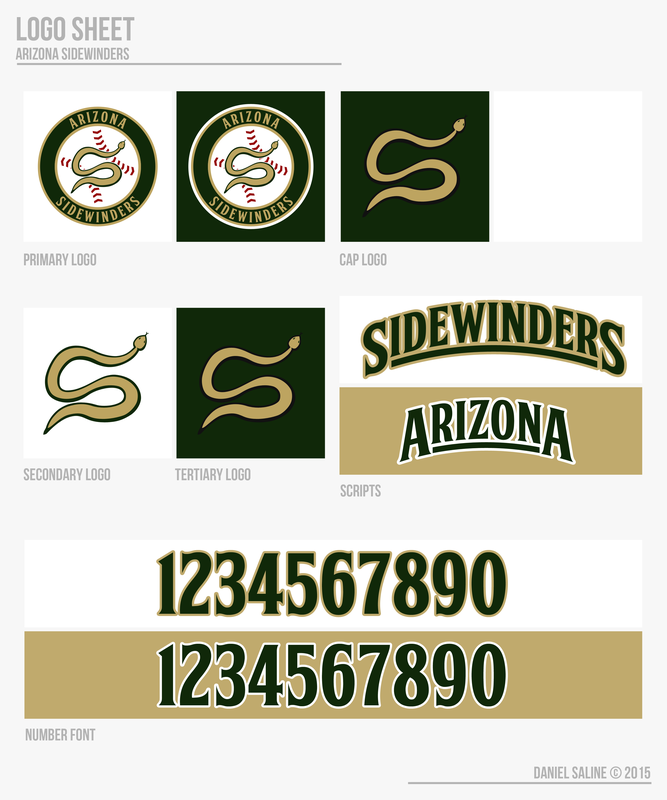 The club is looking into removing the “Sidewinders” script and making the home alternate the primary home jersey, as some consider the regular home too clunky and cluttered. 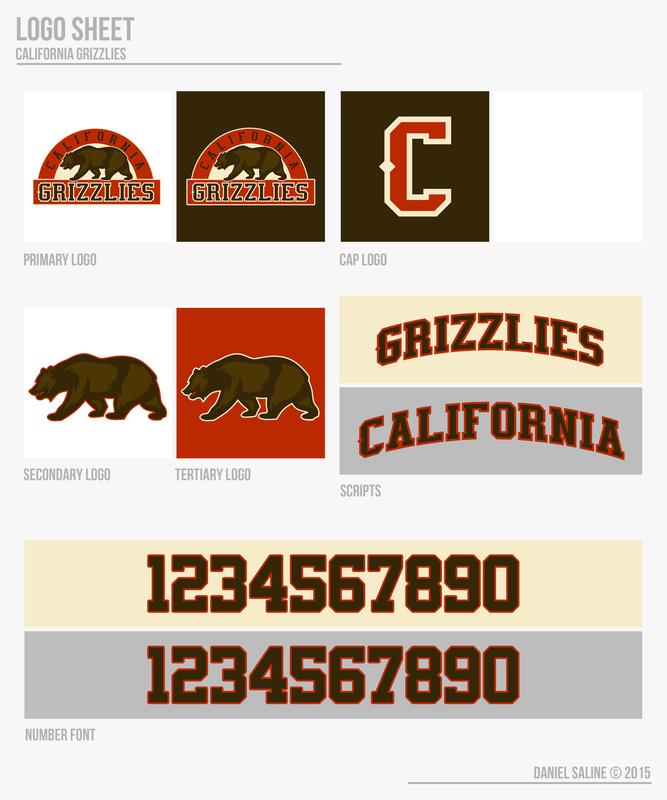 The custom number font is meant to mimic the rest of the identity. 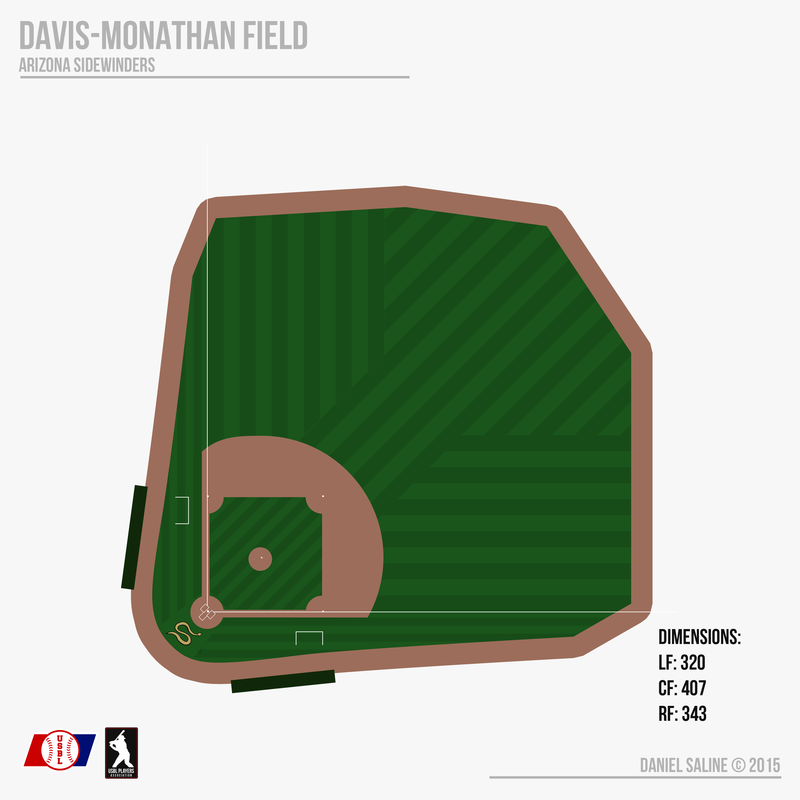 Davis-Monathan Field is named after the Air Force base nearby in Tuscon. The team is very well connected with the military and used to have camoflage Sunday sets to match. The grass design looks like a mistake--and was. In 2000, the grounds crew accidentally mowed down the grass in the wrong places, making for an unconventional look. The team suddenly caught fire, and the “design” has been kept ever since. Bizzare, but true. You can’t make this stuff up. 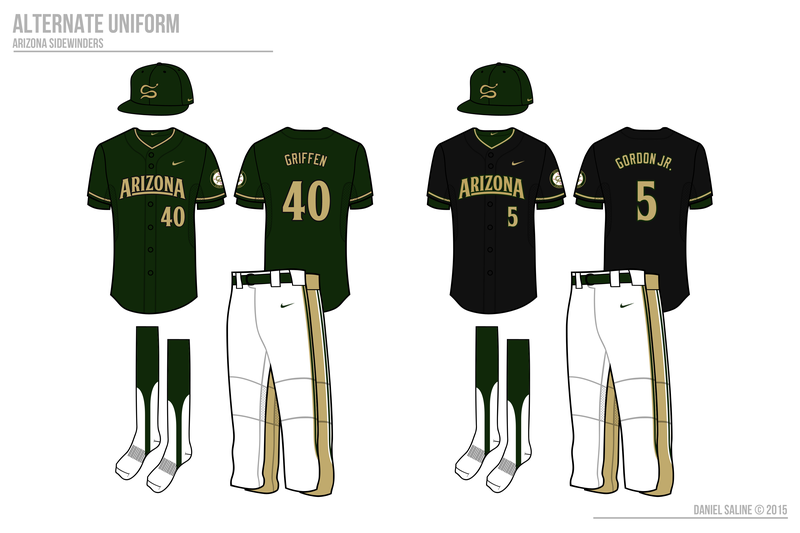 That dark green alt is beautiful, and I prefer the script whites to the alt whites. Just found this for the first time and I can honestly say this is the most fun I have EVER had looking at concepts. Arizona is my favorite team so far, especially those primary home whites. I would buy one of those in a heartbeat!!! All the teams are really really cool and I can't even express how eager I am for the next few teams to get posted!!!! Get it up!! Having a blast!! This might be one of the greatest concept series of all time. The word mark in Arizona is fantastic. And the dark green is amazing. 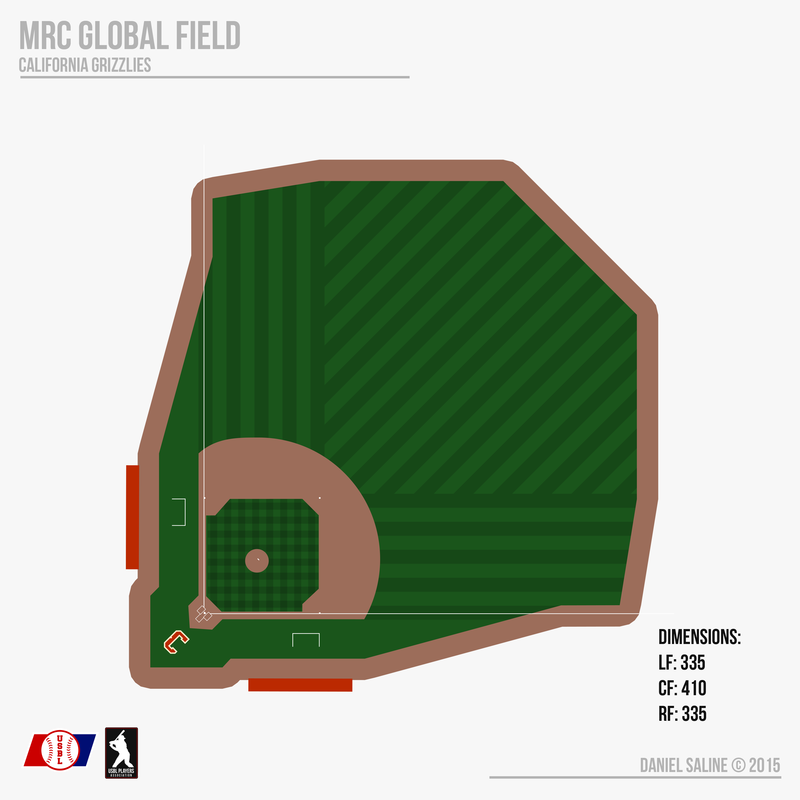 The info on the weird pattern in the outfield is a really cool piece of info. I can't wait to see the new teams!